The economic prescriptions of the IMF and World Bank have forced countries like Zimbabwe to reduce their budgets on social services as they seek to impress and attract investors and credit lines in line with the neo-liberal path which the country has embarked on. Sanitation, emergency services, disease outbreak prevention are all poorly resourced, and often times we lose lives that could have been saved. Statistics of past natural disasters in poor countries reveal the higher death tolls compared to rich countries. The Civil Protection Unit of Zimbabwe developed the National Flood Plan Management framework, but because of lack of resources the plan for disaster management was not fully implemented. The Donald Trump administration and the European Union (EU) have extended their sanctions on Zimbabwe despite the government’s reforms and capitulation to neo-liberal dictates in the form of austerity measures. This means that Zimbabwe must brace for further economic turmoil because of the renewal of sanctions. To further exacerbate the situation, Zimbabwe is facing drought and trying to recover from the gory effects of tropical Cyclone Idai. The entire infrastructure of Zimbabwe is a disaster. 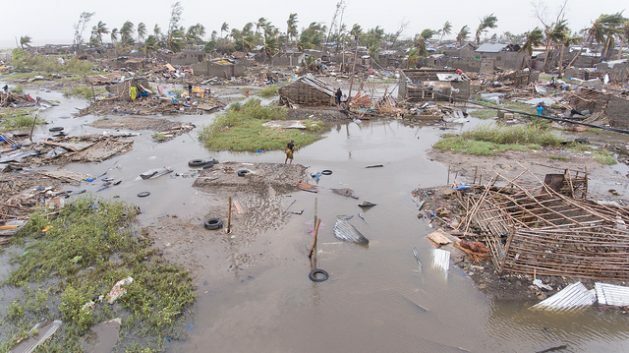 If Zimbabwe were not under sanctions, its response to Cyclone Idai could have been much better. This shows that by imposing sanctions, the United States was deliberately out to harm the people of Zimbabwe — as it is impossible to defend oneself with hands tied behind your back. Every nation under U.S. sanctions has failing healthcare, dwindling government coffers, failed service delivery, and food and basics shortages. It has reached the point where Iran took the U.S. to the International Court of Justice, where in October 2018 the ICJ ruled that the U.S. must stop restricting medical and basic supplies to Iran. The rich countries have technology of early warning systems and disaster management and preparedness, and it is only the poor countries like Zimbabwe, Malawi and Mozambique that bear the brunt of the effects of natural disasters, with the biggest number of casualties. Western capitalism must give poor nations debt relief and allow them to chart their economic path using their own natural resources. Zimbabwe upon independence inherited and adopted the Rhodesian debt, whose money was used to kill the Black people in their quest for freedom and self-determination. South Africa also adopted the Apartheid debt, which it is still paying up to this day, paying a debt whose money was used to oppress the Black majority, butchering them with impunity. Because of the rapacious nature of the capitalist economic system, which has no regard for the environment, we are now confronted with an environmental crisis that threatens to undermine the basis of civilization and the survival of the human species. Global climate change is potentially the most catastrophic and symptoms of the crisis. There is now a global consensus that the emission of greenhouse gases is caused by use of fossil fuels which global capitalism has relied upon as the main source of energy supply. Global temperatures are precariously rising. China is now the biggest player in the global capitalist economy, and it has overtaken the U.S. as the biggest carbon emission emitter. China and the U.S. combined account for 40% of the global emissions of carbon dioxide. If the levels of emission do not subside, the world will experience more extreme floods, droughts, and storms, disappearance of the Arctic ice cap, dramatic cuts in food yields and the drying out of the Amazon rainforest. Notwithstanding all the looming catastrophe world gas and coal production is surging. The great danger today with the way in which these environmentalist topics are being addressed is that they are being used with a short-term political objective in mind. Many researchers and scientists are reaching a conclusion that there is a tendency towards climate warming. More organizations and political parties are being formed on the pretext of fighting against global warming without any practical result. There is a deliberate diversion from the real polluters by asking citizens to be responsible and make them understand that they must take care by throwing plastic materials into different waste bins and that they should stop buying cotton buds from supermarkets because they are a terrible source of pollution. The poor are not causing the problem, but they bear the brunt of climate change. They are suffering from drought, and they suffer in the worst storms, because they cannot afford to build houses that can withstand storms or escape to higher ground. Governments encourage citizens to do one green action a day but ordinary citizens are not the root cause of climate change. Extreme weather disasters are becoming more prevalent around the world, be it Zimbabwe or elsewhere. Capitalism is the biggest culprit. Let’s save our environment and nature from global capitalism.